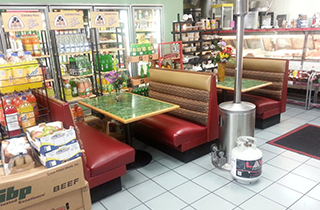 Come to El Torito Foods for Mexican classics and groceries, delicious fresh Mexican food. El Torito, your place for great tacos and the Mexican classics. El Torito Foods the place for tasty authentic Mexican food. El Torito Foods: we sell meats fresh. Come and get them at El Torito Foods! Turn To El Torito Foods When You Want The Very Best! Are you looking for Mexican classics and Latin American groceries? Need a place for delicious and fresh menus? Scoping out taco shops in Vista, CA? 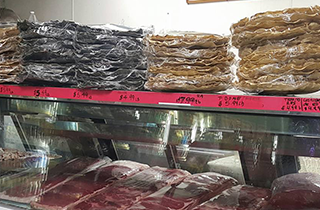 Looking for a reputable carniceria for high quality meats for traditional Mexican tastes? Come on over and drop by El Torito Foods. Look no further for Mexican groceries, a Mexican restaurant, and a meat market. We are the place to visit for all your food needs. El Torito Foods is a great purveyor of Mexican groceries. We are the place for Latin American groceries, the usual Mexican classics, as well as for Oaxaca products. We offer tacos specials in our venue. 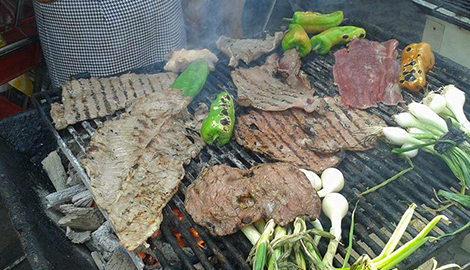 Our tacos are from fresh meat, and our carne asada has a delicious and consistent taste. 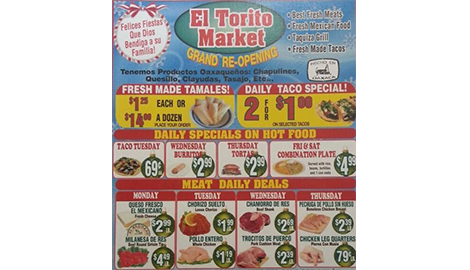 For Hispanic groceries in Vista, CA, come to El Torito Foods. El Torito Foods is also a great Mexican restaurant offering delicious and fresh menus. Our rice and beans are a specialty, as well as our tacos, with a choice of carne asada tacos and chicken tacos. We offer tasty Mexican meals, and great and authentic Mexican food in Vista, CA. We are also a meat market offering prime and fresh meats. We have butchers to handle and fabricate our high quality meats. 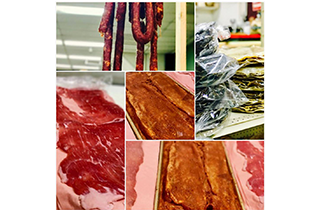 You can really on us for outstanding and extraordinary quality meats that offer traditional Mexican tastes. Look no further for a carniceria in Vista, CA, and come to El Torito Foods for prime fresh meats. 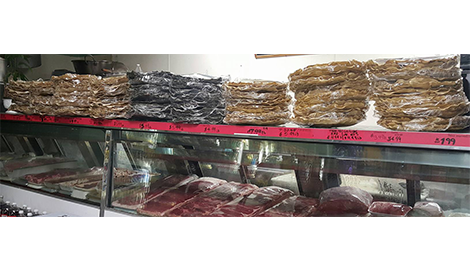 Come and drop and visit us at El Torito Foods your choice for Mexican groceries, authentic Mexican meals, and prime fresh meats. We also have money transfers service and prepaid cell phones in our stores. El Torito Foods is open from Mondays to Sundays to provide for your Mexican tastes. El Torito Foods Mexican tastes and flavors in Vista, CA.